Steaua de Mare Complex 3 stars from Eforie Nord is composed of Delfinul Hotel, Hotel Meduza, Steaua de Mare Hotel, Luxury Apartments and one of the most important treatment centers on the seaside,Aqvatonic Med Spa & Wellness (formerly Efosan). Together they form one of the largest tourist complexes on our coast, with a capacity of over 900 accommodation places. 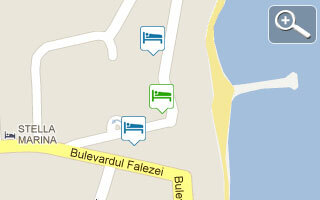 Steaua de Mare Complex is located in the north of Eforie Nord, just 100 meters from the beach. The beach located in front of the complex was widened in 2015. Steaua de Mare Complex is the first accommodation which introduced "all inclusive" travel package in Eforie Nord, for both families with children and those who want to spend a carefree seaside vacation, with everything provided.The All inclusive package includes the following services: accommodation, breakfast, lunch, dinner - Swedish buffet, alcoholic and soft drinks included during meals, beer and soft drinks served from 09.00 - 19.00 at the pool bar, snacks between meals range 16.00 - 18.00 (pastry, minipizza etc. ), access to the resort swimming pool with sunbeds (limited places available), access to outdoor playground areas for children (3 seats for children 2-12 years), access to kindergarten with supervisor (children 2 -8 years), access to indoor play place for children, with animation and fun activities, free parking, wi-fi. It is mandatory to wear identification bracelet (received at the reception), the entire length of stay for those who benefits from All inclusive package. Aqvatonic Area - water basin totaling 400 sqm, with water ranging between 28 and 34 degrees C, with waterfalls for cervical massage, geysers, swimming lanes, color walk from current salt mine with salt Himalaya and salinization Therasol Finnish sauna, steam bath etc. Sports Area - fitness equipment, elliptical, horizontal and vertical treadmill, aerobic training, "staff training", stretching, pilates, presses and multifunctional devices BioForce type etc. SPA Area - massages and mud baths ofTechirghiol, facials, underwater massage, galvanic treatments, treatments colono hydro-therapies etc. Med Area - magnetic therapy, electrotherapy, laser therapy, galvanic baths, aerosols, etc. Fun Area - pool tables, playground for children, air hockey, driving simulators etc. Bistro Area - dining area, healthy menus designed by nutritionists, including children. If you would like more information about the services provided by Steaua de Mare Complex, click here. The Delfinul and Meduza Hotels- all rooms are upstairs providing sea view, air conditioning system, TV, minibar, bathroom with shower (bathtub in the suites), telephone, bathrobe, hairdryer,key card access, carpeted floor, double glazed windows, Wi-Fi, safe. The suites consist of living room with sofa and bedroom with double bed. The rooms distribution of the rooms at Delfinul and Meduza Hotels will be made at the front desk. No balconies are available for these hotels. Luxury apartments - apartments are located in two renovated villas, situated 50 meters from the beach. Other services: free parking, free Wi-Fi throughout the complex, card payment, child seats in the restaurant, cribs upon request non-smoking rooms, rooms for people with disabilities, access ramps for wheelchairs, bicycles provided free Tourist Board Storage, playgrounds for children etc. - 2 adults + 2 child - 1st child 0-1.99 years and 2nd chid 2-6.99 years, both children will enjoy of free accommodation and meals, without extra bed. Include 3 terapii Med/ namol Techirghiol/Kineto/hidroTermo (fara masaje) conform recomandarii medicului Aqvatonic Med Spa. acces la zona Wellness si terapiile aferente. Include 4 terapii Med/ namol Techirghiol/Kineto/hidroTermo si masajele aferente terapeutice conform recomandarii medicului Aqvatonic Med Spa; acces la zona Aqvatonic si terapiile aferente; acces la zona Wellness si terapiile aferente. - Tarifele sunt valabile pentru minim 5 zile de tratament. - Pentru terapiile achizitionate in avans pentru minim 7 zile consultul si evaluarea medicala sunt oferite in mod gratuit. In timpul sezonului accesul la zona Aqvatonic si Wellness este limitat la 2 ore/zi. In extrasezon accesul este limitat la 4 ore/zi. Pachetul de Tratament BALNEO SPA include zilnic masaje subacvale, cure de aerosoli si sesiuni de saune + 3 terapii medicale/zi timp de 6/12 zile (terapii laser, magneto, electro, tens, galvanice, infrarosii, cu namol de Techirghiol, dus Vichy, aqvaGYM, kineto, hidromasaj sau dus subacval) in conformitate cu planul ales de medicul nostru dupa consultul medical inclus. Medicul recomanda un minim de 12 zile de tratament pentru a putea beneﬁcia de efectele unui tratament complet. Indicatii: Afectiuni reumatismale degenerative si inﬂamatorii, lumbago cronic, hernia de disc, afectiuni neurologice periferice si centrale, recuperare postraumatica si post chirurgicala, osteoporoza, hipertensiune arteriala forme usoare sau medii, tulburari circulatorii periferice, arteriale si venolimfatice, afectiuni ginecologice inﬂamatorii cronice, sterilitate secundara, afectiuni dermatologice (psoriazis, neurodermite, acnee) afectiuni ORL, afectiuni respiratorii. Acces nelimitat la Bazinul AQVATONIC si la facilitatile Wellness / zona de Fitness/Kineto . Pachetul de Tratament BALNEO SPA + include zilnic masaje subacvale, cure de aerosoli si sesiuni de saune + 4 terapii medicale/zi timp de 6/12 zile (terapii laser, magneto, electro, tens, galvanice, infrarosii, cu namol de Techirghiol, masaje terapeutice, drenaj limfatic, reﬂexoterapie, dus Vichy, aqvaGYM, kineto, hidromasaj sau dus subacval) in conformitate cu planul ales de medicul nostru dupa consultul medical inclus. Medicul recomanda un minim de 12 zile de tratament pentru a putea beneﬁcia de efectele unui tratament complet. Accomodation offer at Complex Steaua de Mare - Hotel Delfinul, Meduza Hotel Eforie Nord is published by Litoralul Romanesc.ro Tour Operator Agency.